October 1959 saw the Series 2 come onto the market, launched with the slogan Lambrettability, see exciting new places, enjoy exciting new experiences, and make exciting new friends the Lambrettability!. Adverts featured a picture of a man and woman on a beach next to a Lambretta S2. 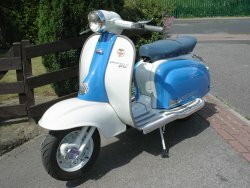 Adverts also went on to state "Lambretta Britains most popular Scooter. 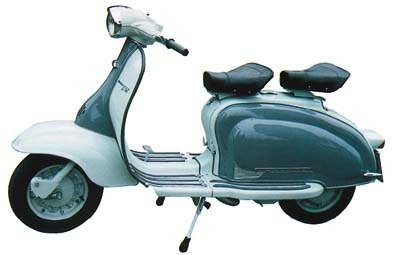 This was the truth, as the Li 150 Series 2 was the biggest selling model they ever made, with the 150 and the 125 versions over 270,000 examples were made. Engine wise a few changes were made from the first series, a longer cylinder and piston assembly was fitted, all models air intake systems were as per the last versions on the series one, with a air scoop between the two seats, or underneath in case of the bench stye seat, which feed down to the carburettor by means of a metal hose, then onto a rubber hose to join the carb. Carburartion went up one size to a MB19, BS5 for the 125 and Bs7 for the 150. The Series 2, now featured a headlight built into the headset top, which turned with the steering. Li 125 models came with a single front seat as standard, while the 150 had a rear also. The rear on the 125 was a cost option, as was a single bench seat. Flooring was different from 125 to 150 models, the 125 had grey floor rubbers, with "cross cross" alloy channels on top. The 150 versions had alloy channels, with rubber inserts into these, with end caps to finish off the rubbers. Mid production changes were from the early style of rear rear light as found on the Li first series, to a later taller one offering more lighting area. Again as per the first series models, early examples of the second series retained the round horn grille, with later ones switching to larger a pear shaped horn grille. 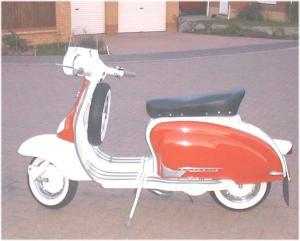 The badging on the Li's wore the same long "Lambretta embellisher" as the first series models. Leg shields wore a crest in the centre of the horn casting, which hid two bolts to help secure the horn casting, and badge clip. On the leg shields was fitted a thin chrome Lambretta badge, with either a Li125 or Li 150 model badge beneath it, again chromed. UK models also gained a round brass badge, with the St Georges dragon on it. All body rubbers and trim were grey, along with the control cables, except for the following :- The stand feet and kick start rubber were black, the rear light body gasket was white. Other improvements were mainly to the engine, with stronger crank and bearings. Colours for the Series 2 were generally two tone, with red/grey, blue/grey, coffee/cream, yellow/orange with grey, and then in complete colours of mistletoe green, Winchester blue, powder blue and red. Mostly supplied with separate saddle seats, later ones came with a dual seat as standard. The new models were even cheaper than the series one models they replaced helping Innocenti to achieve sales.